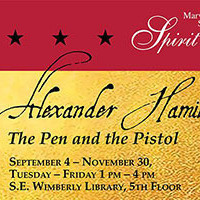 The Pen and The Pistol exhibit will be on display for students and the public. It's located on the 5th floor of the S. E. Wimberly Library in the Spirit of America Suite and will be open from 1 p.m. to 4 p.m on Tuesdays-Fridays. This exhibit explores Hamilton’s life and features original objects from the “Marvin and Sybil Weiner Spirit of America” collection. Dr. Adrian Finucane, FAU Assistant Professor of History, and Ryan Dalmotte, FAU student, specially curated The Pen and The Pistol exhibit. I loved all the exhibits you had.